Well today is the 1st of August and its my son's girlfriend's birthday next week. And I was struggling of what kind of card to do her. I looked through the pile of rubber stamps and this one just jumped out at me as she has a cat so this was ideal. The stamp is from the Barkley range called Be fabulous. Cute little image, pretty card. Love this stamp Sam. One of my favourites. Beautiful colour and design. Cute image and a lovely card. I am sure she will love it. Beautiful image with the hint of the different colours. I love yellow, and this embossed yellow backing looks super! so sweet and adorable card Sam. Oh I love this, Sam! Kitties are my favourite! I'm following you now! Today I'm checking out all my fellow Glitter n Sparkle teamies' blogs - should have done it sooner really. 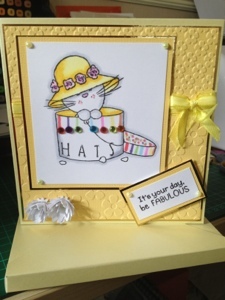 I always enjoy your Glitter n Sparkle creations - you have so many clever ideas!